This photo as sat in my draft folder for many months. I made it with my iPhone, as I hiked a favourite trail with my wife and daughters. I’m not sure what it is about this image that has kept it ‘on hold’ for so long. I was experimenting with long exposure with my iPhone, seeing if I could recreate the abstracts that I make with my main camera. The resulting image is a bit softer, without the saturation I get with my Nikon, bit the image is still pleasing and effective. The real trick to achieve the effect I enjoy so much is in the movement of the camera itself. Basic settings remain the same, but the ‘feel’ of the pan or vertical ‘sweep’ that I use is different. With more practice I could probably get close. This entry was posted in Photography and tagged abstract, forest, hike, ontario, summer on July 31, 2018 by Ed Lehming Photography. I’m one of those people who loves storms. There is something in the unbridled power of them that fascinates me. I love the many forms that the clouds take as the winds whip and shape them. There is also something glorious in the way the storm changes the light. A few days ago, after coming home from a nice dinner with my wife, I saw this storm cloud forming behind my house. I ran inside, grabbed my camera, and made a few images as it quickly billowed higher into the sky, changing form every second, hoping to capture it at it’s peak, before it tore itself apart or diffused. I was also working with great light and did not want to miss the bright rays playing off the sky behind it and within the cloud itself. My goal is always to capture an image representative of what I saw, as well as how I perceived it. Here, I was trying to capture the play of early evening light within the cloud as well as the ominous feeling of the deep tones within the cloud. I think I succeeded in both and am very pleased with the results of a quickly composed shot. This entry was posted in Art, Nature, Photography and tagged clouds, ominous, storm, summer on July 30, 2018 by Ed Lehming Photography. Strangely, the Jethro Tull song that I chose for my quote kept going through my head for much of this hike. How appropriate is that? One of the things that I really notice as I hike is the marvellous play of light through the canopy, high above. I’ve talked about this before, how the forest floor fairly glows as beams of light penetrate the leaves. This light is nearly always present, wit the exception of overcast or rainy days, and even then some stray light seems to make it through. On this day, an extended 14km hike gave me lots of time to drink in this light as it reflected off the trail and cast a warm glow on the surrounding trees. It’s this wonderful contrast of light and shadow that I enjoy so much as a photographer and participant in the life of the forest. This was a fairly hot yet breezy day and the light was constantly shifting. As I did not have my wide angle lens handy, I resorted to my iPhone to try to capture one of these moments along the trail. This entry was posted in Art, Landscape, Nature, Photography and tagged Durham Forest, forest, hiking, light on July 29, 2018 by Ed Lehming Photography. The earth does delight in our bare feet and the trail rises ahead to greet me. I’ve spent the past couple of weekends back on the local trails, enjoying the fresh air and sound of the wind shaking the branches high above me, the air is filled with birdsong and the scent of tree sap. 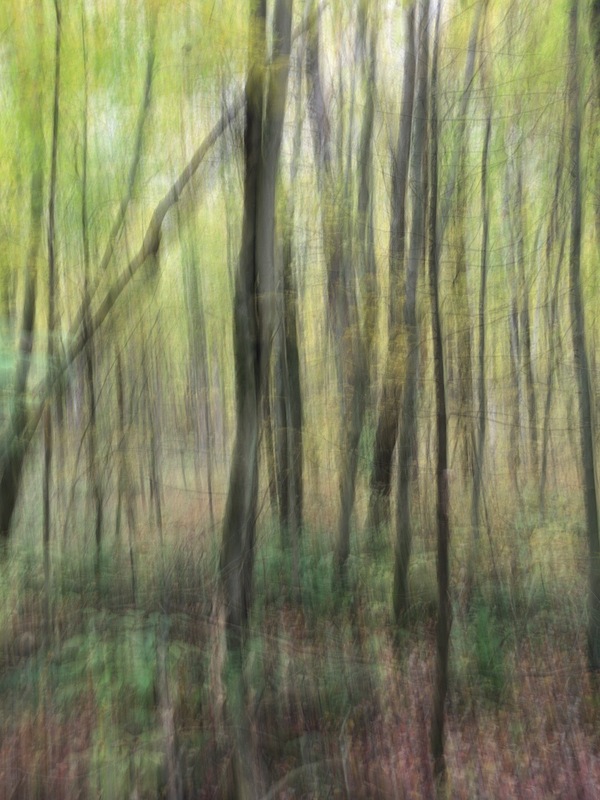 One of the things I try to communicate through my abstract photography is that the forest is a living breathing thing, it’s seldom still and especially so on windy days. Last weekend, as I was making a series of images on the trail, a gust of wind caught me, just as I snapped the shutter. I make these images freehand, as I like the natural feel and control I have of the creative process. The effect of this ‘gust’ was a very slight shift in the first portion of the my upward sweep, which at first bothered me, but the more I considered the final image, the more I liked it. The movement is a bit more distorted but adds a different axis of movement, caused by the wind which seems to make the whole scene spring to action, as if rustling in that same breeze. It’s like witnessing a deep exhalation of the forest, for a brief moment, and then it all settles back to the norm. This entry was posted in Abstract, Landscape, Nature, Photography and tagged forest, life, movement, wind on July 28, 2018 by Ed Lehming Photography. I find my life, at present, troubling, I struggle for direction and find myself torn between a multitude of emotions: anger, sadness, grief, disappointment, and betrayal to name a few. I am uneasy about the future, the world around me. It’s a maelstrom of sensations I have not felt before. It seems like negative thoughts and emotions may at any time overwhelm me. And then, beacons of brightness remind me of the path forward. My family is there, trying to comfort me and I hear their words and feel their concern. This is a temporary moment, a juncture of the unfamiliar, yet ahead is brightness and hope. I know this in my heart and need to get my head to follow. I have been blessed with not just abilities and skills but good and caring people, and as I sit writing these words, trying to make sense of things that make no sense, I’m able to draw on my art, my images, the words and actions of the good people in my life and put things in perspective. The world I live in is alive and filled with good and joyful things, I just need to remember them, constantly. Images, like this one, as I let the image fill me, remind me of so many of those experiences, they help ground me. There is a reason for me being in this place and time, just like there was a reason for me being at the place and time when I made the photo, and I find they are weaving together to help me make sense. The word “surrender” echoes through me, not in an “I give up” sense, but rather, I “accept” this moment for what it is, a mere step on the journey. I may have stubbed my toe, but that will heal and I will move forward, stronger for the experience. Despite what feels like darkness, there is always light, I just need to keep focussed on it and appreciate it for what it is, then the darkness seems less dark. This entry was posted in Abstract, Art, Landscape, Photography and tagged acceptance, Conflict, dark, emotion, surrender on July 26, 2018 by Ed Lehming Photography. A reminder, along the way, of what is important. This cluster of tree brought to mind the quote above by Suzy Kassem. So relevant in these complex times. I have a friend who builds hand crafted furniture, all his work, tables and chairs, have three legs. He jokes, two is just not enough, and four is too many. The number three, is balanced and just enough. The number three is in my mind. So, when I saw this grouping of trees, it triggered thoughts of balance, life, and the events happening in my world, outside the sanctuary of the forest. Our world seems to be lacking any semblance of truth, peace is just a dream to many, and in a world of excess, basic needs seem to be forgotten, as we pursue the latest fad. Yet, it seems so simple, doesn’t it? We need all three, in balance, and it feels like one is always lacking, or diminished. concept. At this point in time, as I place myself back in the forest vista, I hold onto this image and try to picture it with one tree missing, and it just isn’t the same. Three are needed. This entry was posted in Abstract, Landscape, Nature, Photography and tagged forest, life, metaphore, three, trees on July 25, 2018 by Ed Lehming Photography.